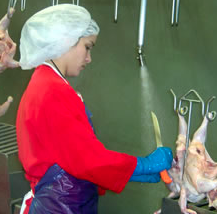 OSHA has launched a regional program, which focuses on reducing illness and injury at southeastern chicken processing facilities. Poultry workers are twice as likely to suffer serious injuries and six times more likely to get sick on the job than other private sector workers, facts that are leading federal safety and health inspectors to act in four Southeastern states to reduce musculoskeletal disorders and ergonomic stressors affecting industry workers. The U.S. Department of Labor’s Occupational Safety and Health Administration today announced the launch of a new Regional Emphasis Program in Alabama, Florida, Georgia and Mississippi intended to prompt employers to protect poultry industry workers properly and reduce injury and illness rates. In 2015, the U.S. Department of Agriculture reported that Georgia, Alabama and Mississippi ranked first, third and fifth, respectively*, among the nation’s largest chicken producers, accounting for 18 of the 51 billion pounds of chicken produced in the U.S.
OSHA’s emphasis program begins today with a three-month period of education and prevention outreach activities to share safety and health information with employers, associations and workers. Employers are encouraged to use this period to bring their facilities into compliance with OSHA standards, if they are not already. The agency will then begin its targeted enforcement phase, including on-site inspections and a review of poultry processing production operations, working conditions, recordkeeping, chemical handling and safety and health programs to ensure compliance. “The Regional Emphasis Program is designed to reduce employee exposure to crippling injuries, such as musculoskeletal disorders, and to ensure the industry records all occupational injuries and illnesses accurately,” said Kurt Petermeyer, OSHA’s regional administrator in Atlanta. The emphasis program ends Oct. 25, 2016, unless extended. OSHA area offices will continue to open inspections in response to complaints, hospitalizations and fatalities. To ask questions, obtain compliance assistance, file a complaint, or report amputations, eye loss, workplace hospitalizations, fatalities or situations posing imminent danger to workers, the public should call OSHA’s toll-free hotline at 800-321-OSHA (6742). Additional information related to the emphasis program is available by contacting OSHA’s Atlanta Regional Office at 678-237-0400. We Fight for Victims of Workplace Injuries in Georgia …Contact us Now for a Free Consultation.